Cambridgeshire FA have announced a new scheme which they hope will at least serve to perturb the amount of abuse their match officials receive during matches. 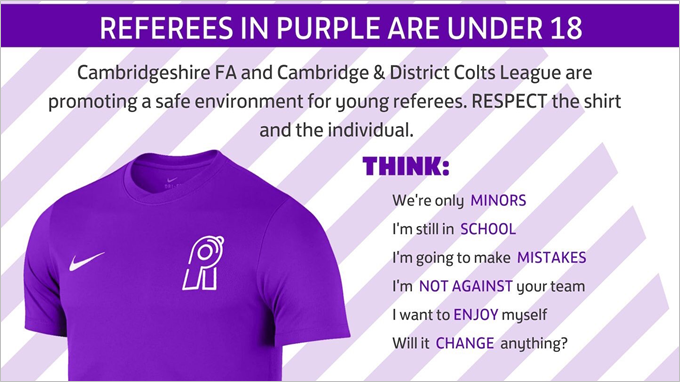 In a desperate bid to hammer home the reality that their young referees are vulnerable human beings who don’t deserve to be harangued and/or threatened by moronic spectators week in, week out, Cambs FA are introducing the ‘purple shirt’ campaign. Excellent idea, though it’s a depressing indictment of amateur football that this kind of initiative is still called for. Hopefully, other regional FAs will soon cotton on and the purple shirt scheme can be rolled out nationwide. Who knows, maybe the full-blown Football Association themselves might even see fit to stump up a little investment in grassroots football. Saturday/Sunday League referees of all ages take a day out of their weekend (for which they are fairly meagerly reimbursed) to oversee non-league football matches and yet many still do so in fear of reprisal and bullying in what can be fairly exposed circumstances. We don’t think for a minute that this will prove to be an instant fix to a deep-seated problem, but it’s something – a start – and that’s got to be a good thing.